There’s a lot of things we have to do annually. Annual dental appointments are important to keep those pearly whites clean. Your smoke alarms should be checked once a year to ensure they are functional. If your car hasn’t had an oil change in a year, you’d better hightail it over to the nearest service station now! With all these yearly tasks we’re forced to remember, wouldn’t it be nice to have something that you knew you could rely on for more than a year without maintenance? A Noritz tankless water heater could well be one such product. 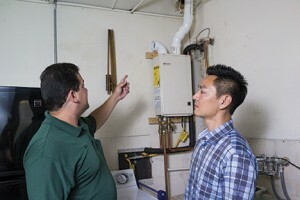 For more details on descaling your tankless water heater, including step-by-step instructions, please click here. Read Tankless Myths 2 in this series about Tankless Myths.